Walkers heading for the hills over Easter are being warned by mountain experts to expect winter conditions on some routes. Heather Morning, mountain safety adviser for the Mountaineering Council of Scotland said many north-facing slopes and corries are still holding substantial amounts of snow. The MCofS said despite the present sunshine, it’s not yet summer in the mountains. Ms Morning said: “At this time of year it is really difficult to know what to expect. One day on the hill could be warm, dry and calm with good visibility, the next you could be in a blizzard. The council said snow patches will often be hard and located high up on the shady, north side of the mountain. 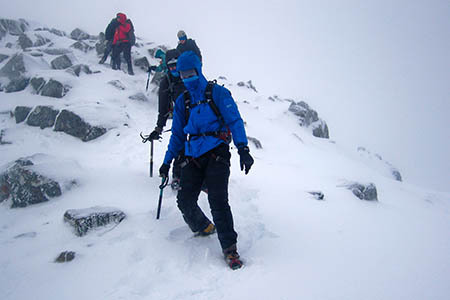 Many traditional mountain routes cross through such terrain and are the usual choice for munrobaggers. Hillwalkers are advised to treat these old snow patches with caution, particularly if the ‘run out’ below is over steep ground. She said a classic example of a popular route still affected by snow is Coire na Tulaich on Buachaille Etive Mòr, in Glencoe. In summer, Coire na Tulaich provides the trade route up the munro but the north-facing corrie holds snow well after it has disappeared elsewhere and can be extremely dangerous. Carey Davies, the British Mountaineering Council’s hillwalking officer, said: “When spring arrives a lot of people feel the pull of the mountains and want to get outdoors again. “But sometimes people get caught out at this time of year. While it may feel like spring has sprung at low levels, up on the mountain tops it can be a very different story. In Wales, the MountainSafe partnership urged hillgoers to consider alternative routes to the popular summits such as Snowdon. John Grisdale of Llanberis Mountain Rescue Team, which is a member of the partnership, said: “The weather continues to be volatile and therefore care is required when planning your trip. “As a partnership, our messages are simple: prepare carefully by ensuring that you have the correct equipment, including a compass and map, food and drink, whistle and torch. “Check the weather forecast for the mountains of Snowdonia before setting out, wear appropriate clothing and footwear for weather that is likely to change. “Make sure you know exactly where to go; choose a footpath that is suitable for your fitness level and the rest of your group and make sure that you know in advance how long your journey will take. Snowdonia national park senior warden Dewi Davies said: “If people want walks that are more challenging during the next few weeks, remember that you do not have to go to the peaks of the Snowdonia mountains to experience adventure. “Snowdonia has a number of suitable walks which do not require special equipment. For example, in the north of the Park, Lôn Gwyrfai is a 4½-mile walk that takes you from the bareness and tranquillity of Rhyd Ddu to village bustle in Beddgelert. “In the south, the Precipice Walk is a three-mile trail which gives you one of the best views of the Mawddach estuary. The felltop assessors who make the trip to the top of Helvellyn each day for the Lake District Weatherline said the mountain still has patches of snow. Their most recent report said: “The majority of the fells are now snow-free, although some isolated patches of snow still remain above 800m. These patches are avoidable, in sheltered hollows and on north through to east facing aspects. “Helvellyn, with its large east face, retains the greatest coverage of snow. Striding Edge is now free of snow but Swirral Edge has a short stepped section of snow. “The milder temperatures have weakened the cornices and snow slopes that exist above some east facing slopes so it’s best to keep away from the snow along such edges. “Despite spring-like weather in the valleys, summit temperatures were noticeably well below zero with the windchill and conditions can change quickly therefore walkers should be adequately equipped with warm clothing and waterproofs. We, my wife and myself, have just got back home from 5 weeks walking in Scotland and totally agree with the comments.